You may have heard me talk about how Slideshare is one of the greatest opportunities in content marketing. With more than 50 Million visitors per month and more than 100 million pageviews, slideshare is one of the top websites in the world and should be a key focus of any B2B content marketing program. The clear winner with almost 2.7 million pageviews, Mary Meeker does it for the 2nd year in a row as one of the the top presentations of the year on Slideshare. This presentation is filled with over 100 charts, stats and trends on digital, technology and economic issues that affect us all. 1.1 Million pageviews for this presentation showing us how to make the best of our most precious commodity: time! More than a million pageviews for this 1st of 2 top Hubspot presentations. Culture is everything and Hubspot does a great job talking about how to create and environment people want to be a part of. Just over a million pageview for a presentation that provides good advice for graduates and hiring managers. 920,000 pageviews for this 2nd slideshare from Hubspot. Almost 560,000 pageviews for this simple slideshare created to help a good cause. 493,000 pageciews for this presentation which tells the unique process for ho you too can gain publicity by trading up the news chain. 413,000 pageviews for this author of a number of good presentations on bad marketing. Check this one out and his others. 409,000 pageviews for this presentation providing tips on how to get unstuck and take the next step in your career. 388,000+ pageviews for the folks at Salesforce earns them a spot on my list. Everyone loves quotes and customer service is a topic we can all relate to. 373,000+ pageviews for one of my favorite slideshare’s of the year from the good folks at Velocity Partners. This rant from Bruce Kasanoff has generated more than 366,000 pageviews as it hits a chord with many of us. 302,000 pageview for this presentation from my SAP colleague Todd Wilms! These are lessons we can all relate to. 296,000+ pageviews for Brian Solis’ predictions for the future of business. The slides include some amazing facts and also tell the story that the world has changed and businesses need to be thinking about innovation. 293,000+ pageviews providing tips on giving a great presentation. 283,000+ pageviews because predictions are always interesting, especially this time of year. And everyone wants a job. This topis has universal appeal. This presentation about presentations has 263,000 pageviews. There is a bukt-in audience for this kind of content on slideshare and lots of slide creators who need to read this. With over 242,000 pageviews, this presentation gives helpful hints on how to succeed in marketing by assuming your audience cares about your brand. With 227,000 pageviews, this presentation is helpful for any business person who ever stands in front of a room and needs to convey knowledge and confidence. This amazing presentation garnered over 226,000 pageviews by simply providing helpful and informative trends and stats for every business. With nearly 218,000 pageviews, this presentation came at a time when the term “Storytelling” became a buzzword in marketing departments around the world. With almost 200,000 pageviews, this is one of the biggest trends in marketing in 2014! Almost 190,000 pageviews, this is going to be a huge topic as the Millennials continue entering (and changing) the workplace. 170,000+ Pageviews, I think this is one of the biggest topics of 2014. Also check out Jeremiah Owyang’s Crowd Companies and the Collaboration Economy presentation from last week. With 160,000+ pageviews, I have to disclose that I worked on this for SAP. It is one of the most successful pieces of content we’ve ever published! These presentations were selected based on total pageviews in the last 365 days, filtered on the Business category, and my opinion on whether the content was valuable to a business audience. Did I miss any of your favorites? Michael, I started to go through a couple of these, but then I decided to skip ahead and skim the slide counts. My rough math, you have embedded more than 1300 slides in one blog post! And that brings me to my observation: as we are all buried under a deluge of content, how many people are just tweeting/sharing this without actually reading through the vast majority of the content you took the time to embed in your post? (my guess: quite a few). Have we (as marketers and individuals) created this content deluge in part because being seen sharing means more to us than taking the time to read, think, consider, or discuss? Wanted to share the thought I had when I came face to face to 1300+ slides next to a Tweet counter. 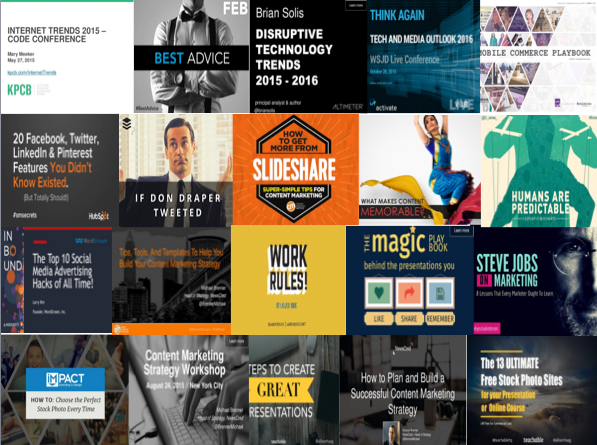 Hey Eric, I have been following these top slideshares throughout the year and was just waiting to create this post because I think too many people ignore or under-estimate the usefulness of slideshare. I think my perspective in creating this isn’t necessarily to add to “the deluge of content” or even to expect that someone would read them all in a sitting. I created this as a resource for people to skim, pick something they think is interesting or helpful or entertaining at this moment, and hopefully, deliver something to them that fills a need. That’s the “ethos” of my creation process. I think most people make a decision to share it with a similar intention, knowing full well that most of their audience won’t find it helpful but a few will. So I guess what I am saying is that I think the process of creating helpful stuff, sharing helpful stuff and reading helpful stuff is hopefully driven by the need to help people. It’s those who create, share and read for other purposes who are being ignored because we are all too smart to see through it. Now where you saw 1300+ slides, others might just be seeing “26 time management hacks” because maybe that is an upcoming new year’s resolution and they might find that helpful. Or, maybe like me, other content marketers are just interested in the type of content that does well on slideshare. I found that to be interesting and possibly helpful to my desire to be creating quality stuff that people are interested in. As always I appreciate your very different and unique perspective! I received a lot of comments about how long my SlideShare was — 80 something pages to make 11 points. But I suspect with many of these, you get through them very quickly. Congratulations Graduate is image-intensive, and the fun of the journey is flying through the slides and quickly reading the text. At least, that is some of the feedback I received this year. This is an excellent aggregate of well crafted and often captivating presentations. What I love most was the use of visuals in combination with minimal wording- it works. Thanks Michael for compiling this list!